Compensators are a great way to reduce recoil, but there are many different designs, and some produce unwanted effects. They can also be very difficult to install. With our walk through, you’ll understand what a compensator is and how it works. You’ll also discover how to pick out the best compensator to suit your needs from our list of the best compensators of the year. Of course, we wouldn’t leave you hanging without a guide to install your compensator, either. With a little homework, it’s easy to find the best compensator and get it running. The good news is, we’ve already done your homework, so read on! It would be nice to live in a fantasy land where there’s no such thing as recoil, but short of finding such a place, we have to find ways to minimize it. While it’s possible to implement minor tricks like using less gunpowder, there are more effective equipment alternatives. It’s useful to first understand what’s happening: when you fire your gun, gas bursts with the gunpowder both forward out of the muzzle and to the rear in a display of the Third Law of Motion. That rear blast is the recoil, so if we want to minimize recoil, we have to do something about that gas shooting back. One of the things we do is, use a compensator. These devices utilize baffle plates and expansion chambers to trap gas and deflect it. As you might expect, there are a number of ways to do that, some more efficient than others, and at the end of the day, we’re talking about adding weight to our gun. Add the fact that it needs to be durable and, you guessed it, choosing one that works well and is affordable can be tough. 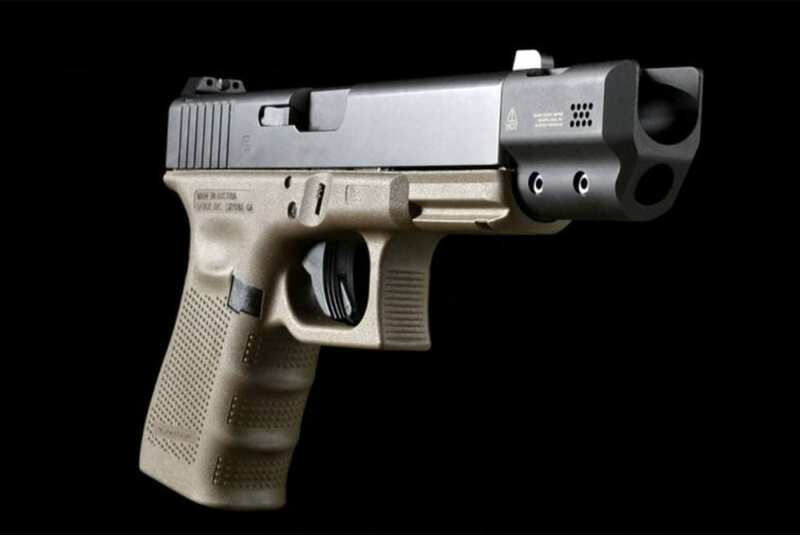 How to Choose a Glock Compensator? ​As stated, compensators add weight, and depending on the model, it can be a lot. Since compensators aren’t absolutely critical, you’ll need to consider the tradeoff. How much weight is acceptable in the quest for less recoil? That’s up to you, but we try to find the lighter ones. ​Since there are a variety of ways to build a compensator, some will be more effective than others. They might also introduce side effects, such as redirecting some gas out of the muzzle, which can change bullet trajectory. ​Some compensators are complex enough that you’ll need a gunsmith to install them. That might be worth it, but it’s good to know what you’re getting into. ​Traditionally, compensators attach to your gun’s barrel, but bushing compensators replace the barrel bushing, attaching to the side. ​Compensators can get expensive, but reducing recoil doesn’t need to break the bank. Use our guide and reviews to find the right compensator for your needs without spending too much. Because there are different types of compensators, and compensators can introduce new and potentially undesired effects to your shooting, it’s hard to find the right one. In our reviews, we point out the strengths of each compensator, and why it’s worthy of your attention—as well as potential reasons you might want to pass on it. Read each, and you’re sure to find the right one for you. 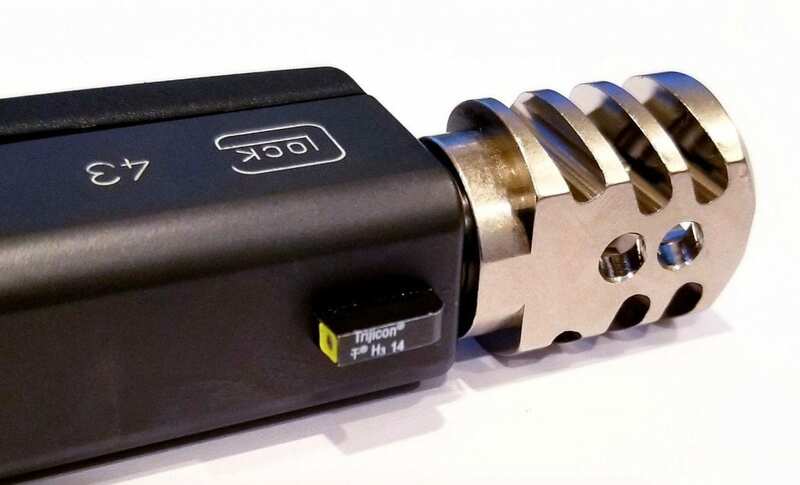 The Compensator Chrome by King Glock is a high-performance compensator which works by redirecting the gas in multiple directions rather than one direction. There are ports facing outward from the unit that direct gas at an angle to the rear, which in turn pulls the pistol forward and causes a reduction in recoil. There are also ports on the top, which are vertically aligned and push the pistol downward. Counterintuitively, this push is a good thing, as this works against the typical force of recoil. It also helps to allow a shooter to retarget while maintaining proper grip and control of the gun. The end result, of course, is faster and more accurate shooting. We particularly like how efficient this device is, weighing in at only half an ounce. Many compensators are easily four times that, so this is a big advantage. The lighter weight will provide more reliable and quicker cycling. Additionally, as it’s made out of high-grade aluminum, so you can trust that it can withstand the constant pressure and heat and last a long time. It’s also an excellent value and is among some of the more affordable compensators on the market. The downside is that is only available for the Glock 43 model with a threaded barrel, so only those owners will be able to take advantage of this deal. If you’re on a budget and looking for a light compensator that won’t leave much of a footprint, it’s hard to beat the King Glock Compensator Chrome. The Zev Technologies Pro Compensator is an incredibly compact compensator. In fact, when you install it on a Glock 19 with a matching Zev threaded barrel, it actually has the same length as a Glock 34 slide and becomes compatible with most Glock 34 holsters. This is a great advantage, as compensators can definitely impact your ability to use holsters. Either way, it will fit and function on any Glock 9mm handgun equipped with a threaded barrel. The Zev Pro Compensator works by channeling pressure through simple side ports. It’s not a sophisticated design per se, but then again 9mm doesn’t produce a lot of recoil. It also works with few modifications to the recoil spring or guide rod, and typically works with an OEM set up. Some setups might require a proprietary Zev guide rod and recoil spring. 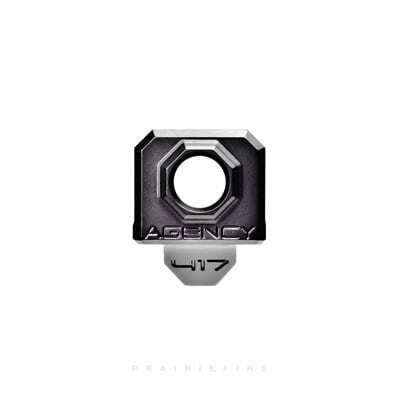 Additionally, it is made from high quality 7075 billet aluminum with an anodized finish. Its small size and light construction ensure a lightweight that won’t affect the overall heft of your gun. It uses a T15 Torx bit, so it’s nice and secure. It should be particularly useful for fans of Zev Technologies parts, as it pairs nicely with just about all of their components and they do make a lot of high-quality parts. It’s always nice to know that you can standardize a set with assured compatibility, as sometimes even parts from the same brand are not necessarily compatible. 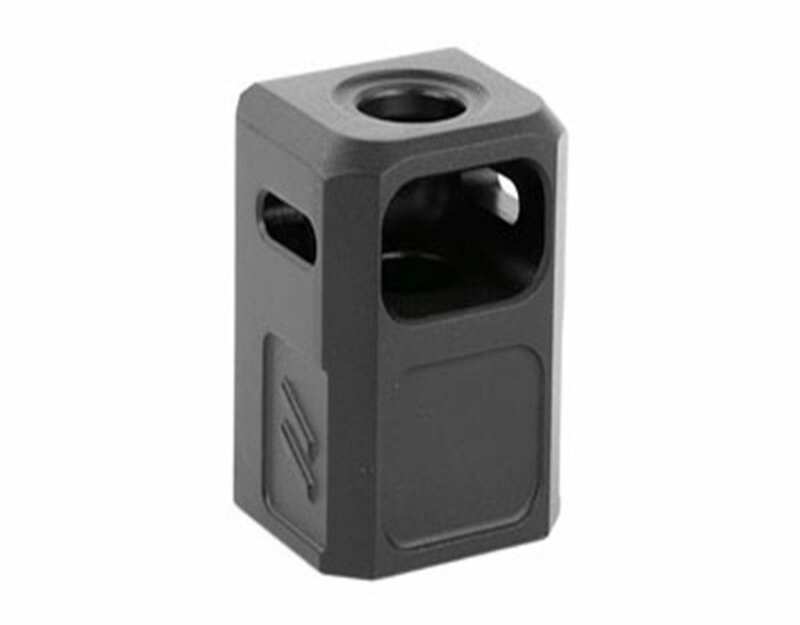 For 9mm Glock owners, a lightweight compensator without a significant profile can bring out the best in competitive shooting, and Zev Technologies offers up a mighty little unit capable of performing well. 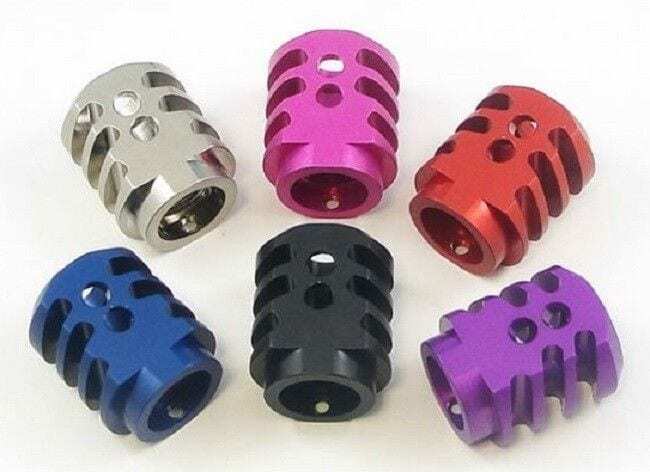 For those who like to add a touch of personalization to their guns, the RYG high-performance compensator definitely has you covered, with six different colors to choose from. You can choose from black, blue, purple, orange, silver, and pink. Of course, not everyone wants or cares about having a variety of colors or customizing their Glock aesthetically, but it’s not something you see every day. You might think that because there are color choices that these are cheap parts, but in fact, they are made from high-quality aluminum to withstand gas pressure and high temperatures, and as such, should last a long time. Additionally, they are some of the lightest, weighing in at only 0.5 ounces. They’re small, too, only 0.996 inches wide, 0.758 inches tall, and 1.2 inches long. As you can tell, there truly won’t be any noticeable difference in the heft of your 9mm Glock. They are manufactured in the United States. Performance is good, with forward facing ports directing gas to a rear angle and pushing the pistol forward to reduce recoil. Meanwhile, vertical ports on top push your pistol down for faster targeting. Installation is simple, as the RYG high-performance compensator simply threads onto your barrel and is secured in place with included screws. Easy and fast, you’ll be up and running with reduced recoil in no time. Not only do RYG compensators allow you the rare ability to choose your preferred color, but they’re some of the lightest and smallest around. 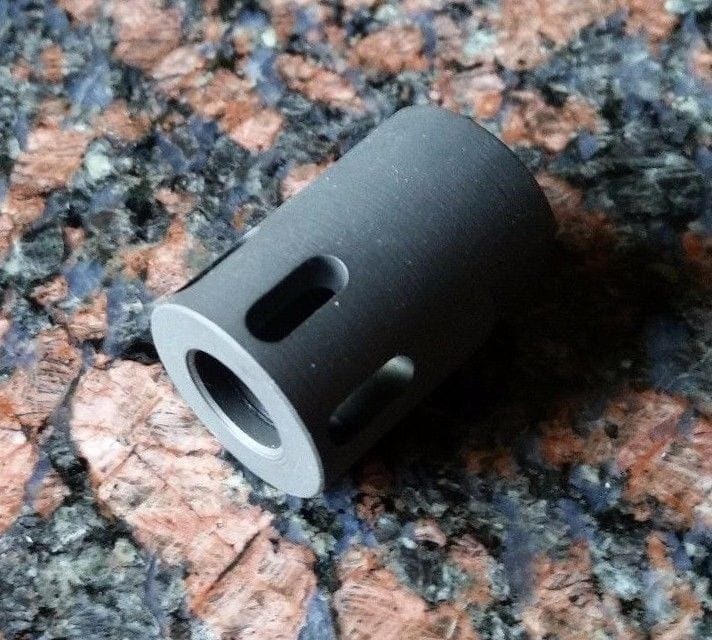 If you’re looking for a small, high-quality compensator for your 9mm pistol, Superstition Precision has you covered with their Custom Muzzle Brake Compensator for 9mm/.233. Unlike many other compensators on our list, which are content to use high-quality aluminum, Superstition Precision has chosen to use stainless steel. Additionally, it has been mil-spec parkerized. Now, there’s nothing wrong with high-quality aluminum, as it’s long-lasting, can withstand high temperatures, and has the added bonus of being lightweight. However, stainless steel has a reputation for a reason, and while it won’t show any immediate performance difference, you can trust that the Superstition Precision compensator will outlast aluminum constructions. 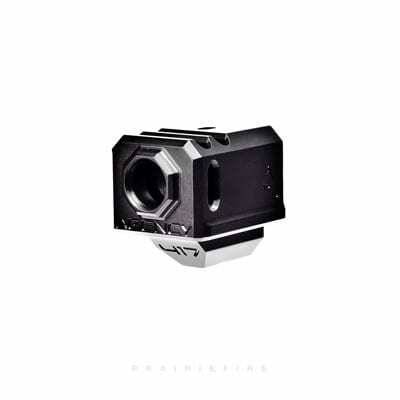 After all, the compensator is designed to absorb and refunnel high-pressure gas and high temperatures, and as such, it needs to endure a lot of stress. It is also very efficient. While it has a similar design to many on our list, utilizing ports, they encompass the compensator’s circumference for quicker venting. As you might expect, quicker venting leads to lower recoil, as the time spent pushing up the barrel is reduced. Nonetheless, it is only 1.25 inches in length and 0.87 inches in diameter, ensuring that it maintains a small enough footprint to not get in your way. Utilizing ½x 28 threads and ¾ in wrench flange, it is proudly made in the United States. One thing we particularly like is the price, as it’s one of the more affordable options on our list. Sure, you don’t get bonuses like choosing your own color, but if you’re after a high-quality construction and on a budget, this compensator is perfect for you. For those on a budget who don’t want to sacrifice quality construction, Superstition Precision offers a high-quality, stainless steel, mil-spec parkerized compensator. Last on our list, the Agency Arms LLC 417 Compensator for the Glock 43 is an excellent offering. The Glock 43 is one of the smallest 9mm handguns on the market, filling an excellent niche for concealed carry. That said, this small size and its chambering in 9mm turn it into quite the recoil powerhouse compared to other guns. Thankfully, this compensator fits any threaded barrels using a standard thread pitch of ½x28 threads per inch. You’ll get two vertical ports and two side ports. The careful placement of these ports ensures minimized recoil, as well as muzzle climb. It is machined from a high-quality 7075 aluminum, featuring two different finishes to choose from, gold or black. While we typically don’t rate aesthetic customization options as highly as functional ones, we do commend the tasteful gold. What we really like is how the factory stock recoil-spring assembly can be used to mount this compensator. No need to purchase extra parts from Agency Arms LLC or anyone else. Plus, the device has a machined hole so that you can mount a front sight, increasing sight radius. This is quite a value, as it’s like receiving another product altogether. Lastly, it ships with all the necessary screws to install the compensator, although installation is a breeze compared to more complex devices. Overall, it’s quick and easy to get going, and you’ll enjoy the reduced recoil and beautiful appearance of this compensator in no time. The potential downside is the cost, as it’s one of the pricier on our list. That said, it’s prudent to remember that you’re getting more here, most notably the machined hole to add a front sight. It wouldn’t be fair to compare its cost to compensators that do not have this feature, and it’s certainly worth the price of admission! But if you’re not looking for extra features, it might be a bit much. Those who don’t mind spending a bit more on a compensator will receive not only an excellent product, but also bonus features, such as the ability to mount a front sight. While installing a compensator on your Glock isn’t the most difficult thing to do, it’s certainly something most gun owners don’t do often. Many users will be attempting it for the first time, and trying anything new is bound to be confusing at first. To demystify this process, we’re going to walk through it step-by-step in the directions below. We recommend making sure you have some Loctite before starting, as well as a set of Allen wrenches. Then, follow along with our video for visual reference, as well as the text below. As always, make sure your Glock is unloaded. Remove the recoil spring assembly. Apply a bit of Loctite to barrel threading. Thread the compensator on until you feel it stop, and back off. Apply some Blue Loctite to the set screws, tightening with an Allen wrench. You want to be sure the compensator stays timed with the Loctite during this process, so be careful. Lightly rotate your compensator to be sure it’s tight, slowly increasing the pressure of your rotation. Reinstall your recoil spring assembly. Reinstall the slide onto the frame. That’s it! You now have a compensator on your Glock! Compensators can be a tricky device for many gun owners, as there are many types out there. They can also be very simple if you know what to look for, and so, we’ve rounded up a great set of simple compensators that do the job just fine without needless complexity or cost. Choosing the right one for you is as easy as reading our guide to determine your needs and browsing our reviews to find the product that meets those needs. When you’ve found the right compensator, follow along with our tutorial to get it up and running. Then hit the range and enjoy your reduced recoil!